I purchased my 2013 Volvo S60 T6 AWD after comparing it to other cars, such as the BMW 3-series and what Infinit and Lexus offers. I could not find a better value than the S60, and the performance is spectacular - and surprising to me. Volvo has indeed changed from the boxy, weak-performing cars they once used to be. Why the 2013 Volvo S60? I compared the 2013 Volvo S60 T6 AWD with BMW 3 series and Infiniti G-35 cars. The performance on the Volvo exceeded both handily. The pickup on this version of the S60 (not the R series) is spectacular - very good performance with high torque. I bought the S60 T6 AWD and not any of the comparable BMWs or Infiniti's due to value. The price of the Volvo compared to the other cars in this model series could not compare to the value the Volvo S60 delivers. I like the design Volvo gave the 2013/2014 Volvo S60s. Excellent style and refreshing changes from Volvo from the past. Volvo has a reputation for quality seating - I am very pleased with the comfort and support. I had a recent trip of about 14 hours, and the seats provided the best comfort I've had compared to all other cars I've owned and have drove in long distance trips. The dealership I purchased my S60 from did a spectacular job of identifying what I needed/wanted out of my new car decison. I spent many different days shopping; they worked very well with me, spent lots of time even when I left not yet having made sure of my decision. Excellent staff, not pushy. I could tell they were very interested in building a relationship rather than just selling a car. Dealership is Barrier Volvo, Bellevue, WA. 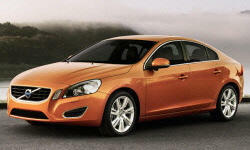 Why Not the 2013 Volvo S60? Rear seat space is smaller than 3-series BMW. It's fine for children/young adults, but full size people will find it a little tight. Volvo should have added about six inches to the length and a few inches in width. The GPS navigation sysem software is adequate on the S60. I've used others (like what Acura uses) and found others easier to use. Also, the dialing features when using blue-tooth connectivity is lacking on the Volvo compared to other cars. Actual use takes a bit longer in the dialing features with a few too-many steps to dial numbers. The trunk is a bit small; if they made the car about 6 inches longer and a few wider, this would not be an issue.